Machu Picchu is not only a well preserved 15th century town, but its location gives it a surrealism and a feeling impossible to find elsewhere. Machu Picchu is truly inspiring, you can try to experience it through videos, photos, thousands of guides on the internet, or even Google Street View, but nothing at all compares with standing in Machu Picchu and feeling its energy. It was considered a sacred city, to the point that people who had already seen Machu Picchu were treated with greater respect; And the first vision that these people had of Machu Picchu, was from the Inti Punku (Sun Gate). Where is the Inti Punku (Sun Gate)? The Inti Punku or Intipunku is located at 2,745 meters above sea level, on one side of Mountain Machu Picchu. If you decide to arrive to this place, the tour will take about 2 hours round trip. 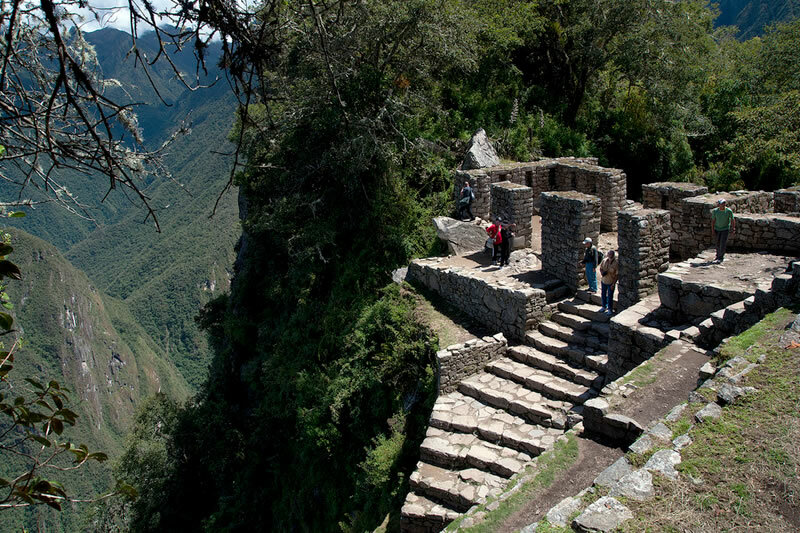 During the Inca apogee, people who entered Machu Picchu after traveling the Inca Trail had their first view of the Inca city from the Puerta del Sol – Inti Punku; As do the people who travel the Inca Trail today. The Gate of the Sun or Inti Punku was a kind of gate of control for the people who entered and left the Inca City. For its remote and strategic location, it is believed that Machu Picchu only welcomed guests and selected from the elite of the empire. How to get to the Puerta del Sol Inti Punku? To get to the Puerta del Sol in Machu Picchu, you must follow the path that goes from Machu Picchu, through the agricultural terraces. The trail is signposted with wooden signs, going almost parallel to the road that leads to the top of Machu Picchu Mountain, but it is not so steep; Puerta del Sol is the place where people who traveled the Inca Trail to Machu Picchu enter. The trail continues beyond the Puerta del Sol for 2 hours, to another beautiful Inca city called Wiñaywayna; However, you can only access this point with the permits for the Inca Trail. Do I need a special ticket to make the walk to Puerta del Sol? No, it will suffice with the Ticket Machu Picchu alone; We recommend to make the walk before 10 in the morning, this will allow you to climb with little sun and few people; Besides allowing enough time in Machu Picchu; In case your return train leaves at 2:00 pm. If you plan to do some of the short walks in the interior of Machu Picchu, we recommend you to use hiking shoes, this way you can avoid accidents in the paved paths. For more information on the Walk to Sun Gate, you can see the Hiking Guide to Puerta del Sol; If you need more information about the trip to Machu Picchu, you can request it through info@boletomachupicchu.com.